Every summer since 2002, the New Music Summit spends a week in July showcasing some of the most innovative and pioneering new music that is happening in California and beyond. At first a celebration of the eclectic vanguard artists on the DIY Edgetone Records Label, the Summit now features a broad range of artists from across the US, Europe, Australia and Japan. It features world premieres and exclusive debuts, raging free improvisers to microtonal composition to experimental electronics to harsh noise, reflecting an incredible range of genre busting exploration and sonic creativity. The Summit promotes intermedia, fostering cross-pollination between disciplines of music, sound art, visual and media arts. It is committed to bringing highly innovative music and art to a growing audience seeking a new experience. The festival concludes this Friday and Saturday. The Outsound New Music Summit marked its 10th anniversary in 2011 with a night of wildly imaginative vocals backed by experimental electronic musician bran…(pos); a performance by East Bay improvisatory ensemble Grosse Abfahrt accompanied by German multimedia artist, Alfred 23 Harth (or A23H); a night of new compositions, featuring Gino Robair’s Aguascalientes Ensemble; and a second edition of “Sonic Foundry,” a true “summit” of some of the most inventive new instrument builders, performing five original collaborative pieces. The festival kicked off last Sunday, July 17th, with its always popular Touch the Gear tm night, a free hands-on expo where attendees can experience new and exotic instruments and electronic gear and make some of their own unique sounds. 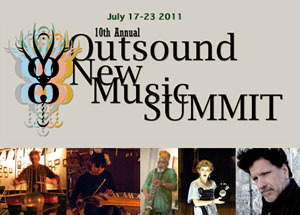 Over the past nine years, The Outsound New Music Summit, presented by Outsound Presents, the Bay Area organization of independent and experimental music and sound artists, has showcased over 300 artists and groups from the U.S., Europe, Japan and Australia, many of them performing in the Bay Area for the first time. Past performances have included the legendary Richard Waters, inventor of the water phone, the instrument you’ve heard in movies, TV, and music CDs but probably can’t name; a 2005 collaboration with the Illuminated Corridor collective, which brings music and film into pubic spaces; and Tom Nunn, musician, composer and designer and builder of over 200 new instruments, who returns this year as part of the second edition of Outsound’s “Sonic Foundry” program. There is more art and sensation to be discovered in music than is contained in hit charts, sound alike trends, or snappy tunes. Or so say a diverse and intrepid band of musicians and sonic artists who improvise performances, make their own instruments, freely cross genres (jazz with classical, say) and media (sound with film or poetry or both), push electronic soundscapes to the edge, and regularly break out in head-banging noise fests. John Cage would approve. Tonight, Friday July 22: ~The Art of Composition~ A night of performances infused with new and exciting compositions with Gino Robair’s Aguascalientes Ensemble performing a musical suite based on scenes captured by Jose Guadalupe Posada in his politically charged engravings of late19th -and early 20th-century life in Mexico, Andrew Raffo Dewer’s Interactions Quartet performing “Strata (2011)”, dedicated to Eduardo Serón, graphic scores by Kanoko Nishi featuring bassist Tony Dryer and Krys Bobrowski’s “Lift, Loft and Lull” a series of short pieces exploring the sonic properties of metal pipes and plates and the use of balloons as resonators, with percussion and objects by Gino Robair. Saturday July 23: ~Sonic Foundry Too!~ Outsound has teamed up with Thingamajigs to produce the sequel to the first Sonic Foundry held in 2006. To celebrate ten years of innovative programming Outsound Presents 10 Inventors in 5 collaborations! Featuring Tom Nunn, Steven Baker, Bob Marsh, Dan Ake, Sung Kim, Brenda Hutchinson, Sasha Leitman, Bart Hopkins, Terry Berlier, Walter Funk. In these masters of the innovative just the visual alone of metal, wood, strings, plastic, rubber, and paper is bound to inspire. Each duo set will enhance these specialized inventions and the inventors that perform on them.